Ice is no joke in Canada. Hoping to provide Canadian consumers with a little more traction, researchers at Toronto Rehabilitation Institute have developed ratings for slip resistant footwear. 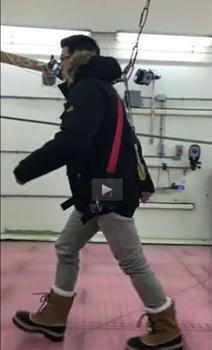 With the help of WinterLab, an underground, state-of-the art research facility located at Toronto Rehab, researchers tested the slip resistance of 98 winter boots, including both safety and casual footwear. The results have been published at http://www.ratemytreads.com -- and they're not encouraging. Only eight percent of the 98 different types of footwear test met the minimum slip resistance standards set out by the Maximum Achievable Angle (MAA) Testing Method, which the researchers used to validate slip resistant footwear on icy surfaces using real people in a simulated winter environment. As a result of the searchers' efforts, consumers will have winter slip resistance ratings available when they purchase winter footwear -- similar to the ratings available for winter tires. In Ontario alone, it's estimated that 20,000 people visit the emergency room each year because of injuries related to falling on ice or snow. A recent Toronto Public Health report revealed that over 40 per cent of those aged 35-59 years and 60 per cent of those aged 60-85 years said they would go out less as a way to cope with the winter weather. It's hoped the new slip resistance ratings will both prevent injuries and give consumers a little more confidence about venturing out. "I expect that many serious and life-changing injuries will be prevented this winter by people choosing to buy better non-slip footwear," says Dr. Geoff Fernie, Research Director, Toronto Rehabilitation Institute. "I also expect the impact to grow with future winters as more manufacturers strive to develop products that score well in our system and can be recommended to consumers." WinterLab has the ability to recreate typical Canadian winter conditions, for example sub-zero temperatures, snow and ice covered surfaces and winds up to 30 km per hour. WinterLab can be tilted to create slopes, or can be moved suddenly to challenge a participant's balance while safely fastened into a harness. Testing in WinterLab is completed on both bare ice and melting ice to simulate diverse outdoor surfaces Canadians may come across in the winter months. Combined with walking uphill and downhill, four conditions are tested for each pair of footwear. The overall score is based on the minimum performance over the four conditions.